Great works have started in 2005, they are now finished ! Cars are not allowed to reach to Mont-Saint-Michel anymore. You can now park your car at La Caserne. Free shuttles are avalaible from the parkings to the end of the bridge, 300 meters away from the Mont Saint Michel. The view is exceptionnal, moreover during high-tides. Shuttles work all year, from early morning to 1 am. 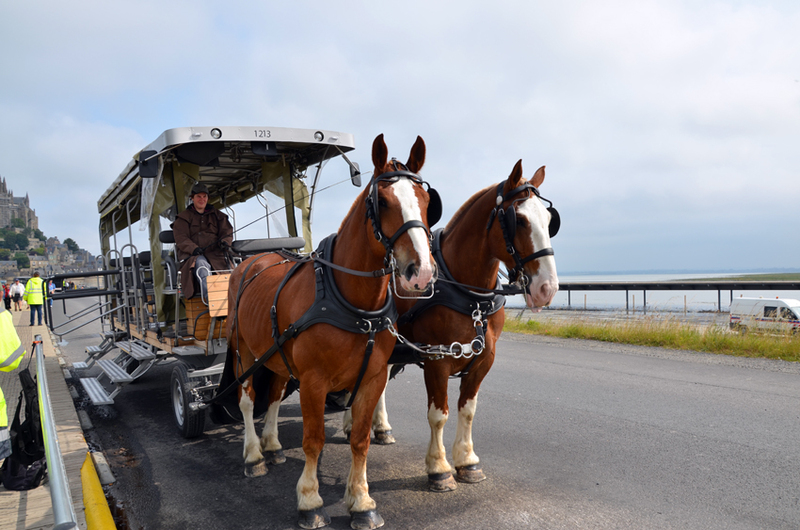 During the high season, des horse-shuttles are also available ! to have dinner and a walk without the crowd ! During the high tides (coef more than 100), you can admire the Mont Saint Michel circled by the sea, and then become an island ! To check the days when this phenomenon takes place, please refer to the schedule below. The coefficients highlighted in red show the tides of exceptional strength, up to the coef 111 mid-September 2018. A step of the famous bike run will stand in Fougères on July, 13th 2018. Fougères is a medieval city, 30 minutes drive from the cottages. You can enjoy visiting the castle which is the oldest of Europe. The famous run between Cancale and the Mont Saint Michel will take place on May, 26th 2018.